stepping out in faith: What is Your Moral Requirement? What is Your Moral Requirement? It was a classic spit take as I sipped my tea and read the article. No this wasn’t some social media meme intended to misrepresent. It was a quote from a pharma executive when asked to explain the price increase on an antibiotic by 400%. The executive insisted the company had the moral requirement to sell at the highest price to make the maximum amount of money. I have heard some smarmy excuses for the excesses of capitalism before. Most organized societies have survived interactions with each other through a common legal code. A moral code would extend beyond that, covering for situations not addressed in the legal code. People tend to assume that a moral code is religious, but it can also be cultural. It is an agreement on what a society deems to be important and how that dictates proper behavior. A moral code always points to an underlying value. If your moral requirement is to set the price for a life-saving medication as high as possible regardless of any person’s ability to pay, your underlying value is wealth. The pharma exec is living an example of the Heinz Dilemma. The only difference is that this pharma exec is not likely to be robbed. Although, it is entirely possible that someone might die because of the price of this drug. 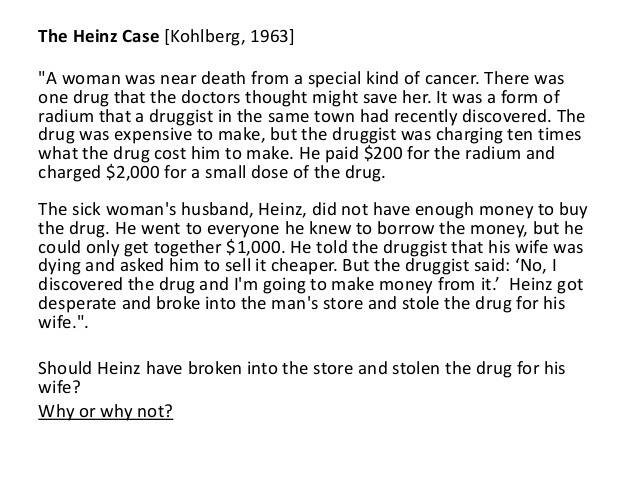 Furthermore, not even the pharmacist in the Heinz Dilemma claimed a moral requirement to charge so much. This claim seems to be a new low. The thing about a human-created moral code is that it can be ambiguous. It is wrong to cause a death, and it is wrong to steal. The moral code does not say which is worse, or when it might be acceptable to steal or look the other way when you could prevent a death. Your decision in this dilemma depends on what you value. What is your moral requirement regarding money? It is easy for me to condemn this executive, but should I be pointing the same finger at myself? How often do I put the value of money over the value of others: decisions about charities, complaining about taxes, voting to restrict spending on missions because our church budget is too tight? What if, in the name of self-discipline and stewardship I am acting against God’s will by putting money ahead of love? What is your moral requirement regarding safety? It is easy for me to justify political decisions that promise safety. Both sides of the political spectrum have supported military spending, guns, fighting the War on Drugs with little more than jail cells, and concrete (or legal) walls to prevent immigration. It is essential to have a strong government interested in promoting safety, but perhaps I am making decisions that fool me into trusting the government, or a weapon, or a policy, over my trust in God? When does God want me to take risks in the name of ministry? I do not want to leave the impression that God’s truth is pliable or ambiguous – it is not. God does not have values or laws that change to suit situations. Nor does He promote that as a solution for us. The world has both right and wrong. But, for us humans the challenge is found in discernment and application. 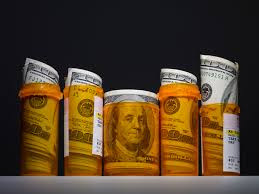 It is easy for us to say that the pharma executive has the moral requirement to put a reasonable price on his drug, but the law says he has the right to put any price on that drug. When we look at laws to restrict this right, we run into the possibility that such laws would cause more trouble. This decision is way above my pay grade – on so many levels. As people of Christian faith, we have two sides to the idea of moral requirement. There is the law side that tells us what is right according to what God requires. There is also the grace side which tells us what is right according to what God shows us. As children of God, we are in a strange and wonderful situation. We are no longer under a law requirement. The law no longer condemns us. It can no longer leave us hopeless and certain of death. We have not lost our need for the law, but it has lost its hold on us, and that makes all the difference. The law is still our curb, mirror, and guide, but instead of sentencing us to death it points us to our need for the Salvation of Christ. We still live under a moral requirement. We live under the moral requirement of love and grace. In judging a situation, we must use both law and grace. We apply law as it is needed, but always in the spirit of grace. If it weren’t for this grace, we would have no hope. With grace, we have every hope. We likely need more laws about drug prices, safety, drugs, and immigration. At the very least, these should be challenging and complicated discussions not left to social media memes. I do not know what the moral requirement for each situation is, but I do know that love and grace must be a part of the equation. We are not people of the law, but people of the cross and the empty grave.